You can install Evernote on Macintosh desktop and laptop computers. On most devices, for Premium and Business users, offline access is supported from the local copy of your notebooks when a network connection isn’t available; notebooks are synchronized when you get back online. 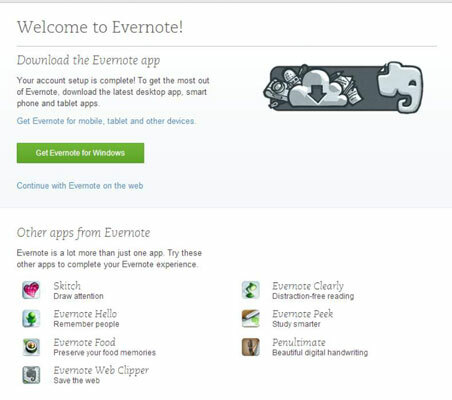 Click the Mac link in your welcome note from Evernote or navigate to Evernote. Evernote recognizes your computer platform and offers you Evernote for Mac. The Mac download page appears and the application downloads automatically. If a problem occurs, click the Click Here link. The license agreement appears. Drag the Evernote icon into the Applications folder. In the Applications folder, double-click the Evernote icon. A message warns you that Evernote was downloaded from the Internet and asks whether you’re sure you want to open it. If you see the Welcome to Evernote screen, type your username and password. (Optional) If you like, select the Stay Signed In check box. You’ve installed Evernote on your Mac.